Bestow your recipients with the luxury and elegance of royal purple. Mysterious, warm, magical, and enticing, purple is one of the most popular colors for weddings and birthday parties. 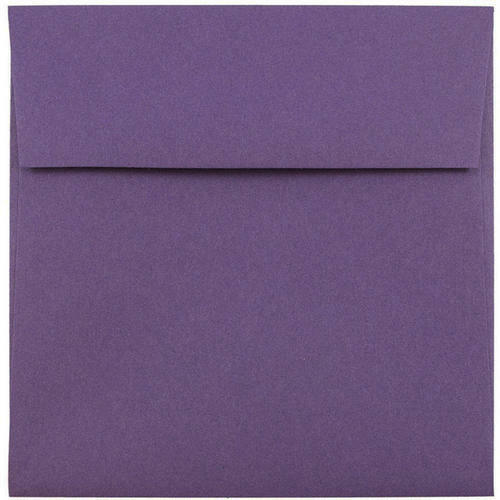 These Purple 8 x 8 Envelopes will certainly compliment any invite, greeting card, or letter ... in any color! From golds to blues, from whites to yellows, purple is a surefire way to make your material stand out. From fairy themed birthday parties to baby showers, purple is sure to leave a lasting impression. Deliver your party invitations, wedding invites, greeting cards, and exciting news with sophisticated covers. Lavender and eggplant flushed envelopes are also great for business. Graphic designers, cosmeticians, and craft makers use it to show consumers innovative and aesthetically pleasing aspects to their companies. Purple 8 x 8 Square Envelopes are available in Primary Blue Translucent and Wisteria Purple Translucent. Give your guests a little hint of what's inside without actually showing them everything! A great feature that makes your things even more unique.